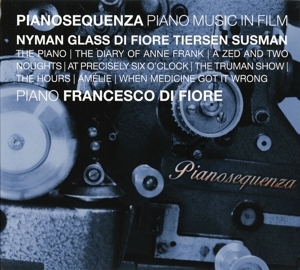 Francesco Di Fiore, pianist and composer, was born in Palermo in 1966. He studied in Austria with Harald Ossberger, in the Czech Republic, at the National Academy of Music, with Peter Toperczer and in Italy with Eliodoro Sollima and Bruno Canino. In 1986 he started his concert career performing hundreds of concerts worldwide. He appears regularly at international festivals presenting his compositions and also music by other contemporary composers. Alongside music for piano, his compositions include chamber and orchestral music and film soundtracks. A large segment of its production also consists of music for the theatre, having composed more than 30 scores for theatre productions, both classical and contemporary. In 2011 he created an original and enormous project called Miniature 2011 in which he composed a new piece each week and presented it on the internet. The project yielded 53 compositions totalling around 210 minutes of new music. He has collaborated with musicians such as Giovanni Sollima, Kim Sang-Fi, Damiano Binetti, Neil Campbell, Mario Crispi, ZoFo Duet and GliArchiEnsemble. A winner of numerous international competitions, his music has been performed internationally in Germany, Croatia, Finland, Spain, France, Romania, Slovakia, UK, Netherlands, USA and China.